Aimed at teaching computer science in schools and spawning a robust hobbyist community, the credit card-sized Raspberry Pi computer has garnered a lot of popularity in the past couple of years. Available in kit form for less than $40, the Pi fits a niche unlike any other in the computer industry. The PI comes in two models — one with two USB ports and an Ethernet port, and one with only one USB port. The Raspberry Pi Foundation, a nonprofit agency, developed the computer. Most Pi computers are manufactured in a Sony facility located in Wales. 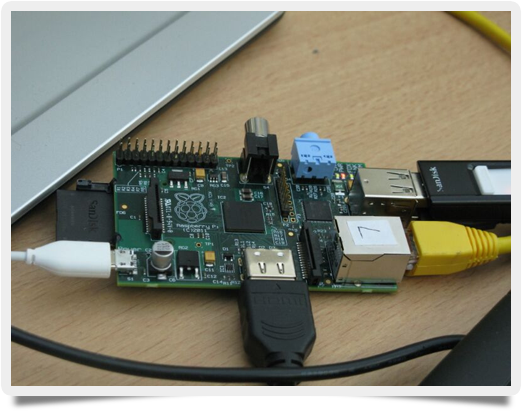 The Pi runs its own distribution of the Linux operating system out of the box. It is powered by a 700 MHz ARM processor embedded on a Broadcom “system on a chip,” which also includes a graphics processing unit (GPU) and 512 MB of RAM. There is no hard drive included, so long-term storage and booting are handled using an SD card. The growing hobbyist community that grew up around the Pi is driving many use-cases beyond the educational reasons for the computer’s original development. In addition to a wide variety of hobbyist uses not too different from those of the Arduino community, Raspberry Pis have also been seeing use in industrial and other scientific settings. Despite its nonprofit status, the amazing success of the Raspberry Pi computer — with over one million units sold — has led to a variety of competitors aiming for that educational or hobbyist computing niche. AMD introduced a hobbyist kit called the Gizmo Explorer, which features a dual-core processor and 1 GB of RAM among other features. Its $199 price tag hasn’t made much dent in the Pi market, however. Intel also recently released a $199 kit computer called the MinnowBoard. Despite the recent competition, there is little denying that the Raspberry Pi continues to usher in a revolution of low-priced kit computers for students and hobbyists. As long as the price remains around $25-$35, expect the Pi’s dominance to continue.